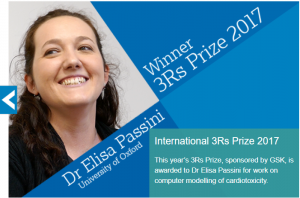 On the 12th of March 2018, the National Centre for the 3Rs (NC3Rs) – an organisation dedicated to replacing, refining and reducing the use of animals in research and testing – has awarded its top prize for a research paper on an in silico model that predicts cardiotoxicity developed and reported by the TransQST team from the Department of Computer of Science of the University of Oxford. Human In Silico Drug Trials Demonstrate Higher Accuracy than Animal Models in Predicting Clinical Pro-Arrhythmic Cardiotoxicity. Passini E, Britton OJ, Lu HR, Rohrbacher H, Hermans AN, Gallacher DJ, Greig RJH, Bueno-Orovio A, Rodriguez B. Frontiers in Physiology. 2017 Sept 12. Their excellent work will be implemented to address the TransQST WP7 challenges in the field of modelling simulation to support drug development.